Akshaya Tritiya is a holy day for Hindus and Jains. It falls on the third Tithi (lunar day) of Bright Half (Shukla Paksha) of the pan-Indian month of Vaishakha and one of the four most important days for Hindus. It is an auspicious day of the birthday of Lord Parasurama who is the sixth incarnation of Lord Vishnu. On this day Veda Vyas and Lord Ganesha began to write Mahabharata. Jains celebrate this day to commemorate Tirthankara Rishabha’s ending of one-year fast by consuming sugarcane juice poured into his cupped hands. The word “Akshaya” means the never diminishing in Sanskrit and the day is believed to bring good luck and success. It is believed that if you do charity on this day you will be blessed. On Akshay Tritiya, Mrutika is worshiped. As per Hindu electional astrology (Muhurta) three lunar days (tithis) are auspicious. These are called Sade-Teen Muhurtas also. These Tithis are first Tithi of Bright Half of Chaitra (starting of new year), tenth Tithi of Bright Half of Ashvina (Vijay Dashmi), third Tithi of Bright Half of Vaishakha (Akshay Tritiya- Parshu Jyanti) it is also Lingayat religion founder lord Basveshvara Jayanti and first Tithi of Bright Half of Karttika are called “Sade-Teen (3 ½) Muhurt”. The first three tithis are counted as full and the last one as half Tithi and constitute Sade – Teen Muhurt. Sun and moon are astrologically believed to be at their most exalted equal brightness on this day. Akshaya Tritiya is also called Navanna Parvam. Akshaya Tritiya falling on a Rohini star Monday is considered more auspicious. In Hinduism, Akshay Tritiya was the day when Vyasa started writing the history of the great Bharat war in the form of an epic Mahabharata. This day is symbolized by god Vishnu, the preserver-god in the Hindu Trinity. 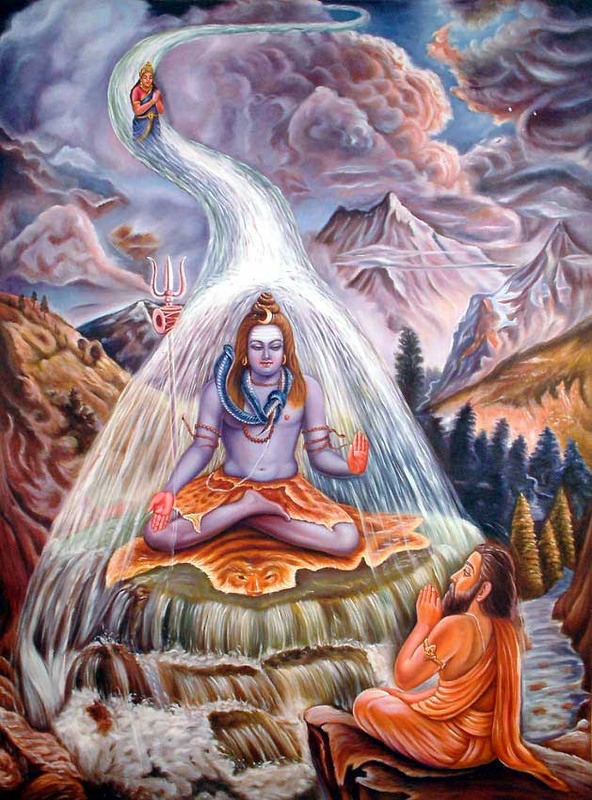 According to Hindu mythology, on this day the Treta Yuga began and the river Ganges, the most sacred river of India, descended to the earth from the heaven. It was on this day that Goddess Annapoorna devi was born. Kubera received his wealth and position as custodian of wealth and property with Goddess Lakshmi on this day, by praying to Lord Shiva at Shivapuram. It is traditionally observed as the birthday of Parashurama, the sixth incarnation of god Vishnu. The Puranic scriptures speak about how he reclaimed the land from the sea. In Mahabharata, Yudhishthira receives the Akshaya patra, which he uses to serve food for all the needy in his kingdom. It is on this day that poor Sudama, the best friend of Krishna visits Him (Lord Krishna) to greet Him after He became the King. With nothing to offer, Sudama takes with him Poha (puffed rice) and offers it to his friend and never discusses his poverty though he intends to. On his return he finds his hut changed to a palace. In more recent history, Adi Shankara recited the Kanaka Dhara Stotr on this day for the sake of the poor couple at whose house he stopped for Bhiksha and was offered their only available gooseberry. Goa and Kerala regions, even today, are referred to as Parushurama Kshetra. Akshaya Tritiya, the third day of the bright-half of the lunar month of Vaisakha is considered one of the most sacred days of the year. In Odisha, on Akshay Tritiya day, farmers start ploughing their land and construction of chariots for Rath Yatra begins at Puri. This day is generally observed by fasting and worship of Lord Vasudeva with rice grains. 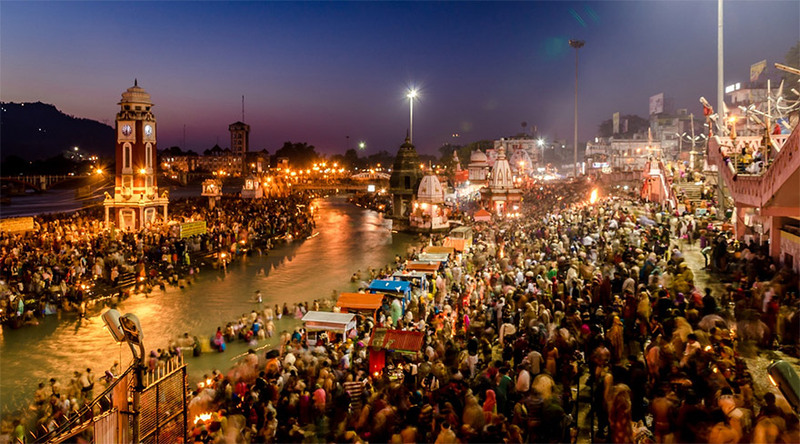 A dip in the river Ganges on this day is considered to be very auspicious. The Vedic scriptures say that knowledge gained or charity done on Akshay Tritiya is very fruitful. It is considered to be a very lucky day to start new business or venture. Many people buy gold or property on this day. Fasts are kept on this day and pujas are performed. In charity, fan, rice, salt, ghee, sugar, vegetables, tamarind, fruit, clothes, are given. The god Vishnu is worshiped. Tulsi water is sprinkled in the nearby area of the idol while performing aarti. In Bengal, on the day of the Akshay Tritiya, “HalKhata” – a ceremony to start the new audit book is performed – with the worship of Ganesha and goddess Lakshmi. Bengalis perform many rites and rituals on this day. This day is most auspicious day for the Jat farming community. Early morning, a male member of a Jat family goes to the field with a shovel. All the animals and birds encountered on the way to the field are omens and predictions for rains and crops. Akshay Tritiiya is an occasion for weddings, which are conducted in mass ceremonies. It is considered an unboojha muhurat. It is believed that god Kubera, the treasurer of the gods, is the richest deity. Lakshmi Tantram says that even Kubera will pray to goddess Lakshmi, the goddess of wealth and consort of Vishnu, on Akshay Tritiya. A day-long Kubera Lakshmi Puja is performed in which an image of Lakshmi is worshiped with Sudarsana Kubera Yantra, symbolising Kubera. On Akshay Trutiya, a king or those who have the responsibility of taking care of the subjects, should perform ‘puja’, with gratitude and devotion, of the picture of ‘Vaibhav-Lakshmi’ with Sree Vishnu as it helps to make the subjects happy and prosperous. “We are not graced by ‘Goddess Lakshmi’ as she is the divine energy (shakti) of Sree Vishnu. How can His ‘divine energy’ come here and bless us if Sree Vishnu is not invited? Therefore, before worshiping Sree Lakshmi in any of her forms, first invite Sree Vishnu and then invite Sree Lakshmi as the worshiper gets maximum benefit of Lakshmi-tattva” (principle). Followers of Jainism consider Akshaya Tritiiya to be a holy and supremely auspicious day. It is associated with Lord Adinatha, also known as Rishabhadeva, first of the twenty-four Tirthankaras. On this day people who observe the year-long alternative day fasting known as Varshi-tap finish their Tapasya by doing parana by drinking sugarcane juice. The day of Akshaya Tritiya is worshiped and said to be auspicious in Jainism because it is said to have established the very first “ahara charya”: a methodology to prepare and serve food to Jain monks. Lord Rishabhadeva denounced the worldly pleasures after dividing his vast kingdom amongst his 101 sons, prominent of whom are Gommateshvara Bahubali (whose world’s tallest monolithic statue stands at Shravanbelgola and Chakravarti Bharata; it is known today as “Bharat”). Lord Rishabhadeva meditated without any food and water for six months and after that set out to accept food (ahara). He was the first monk of this era. Jain monks do not own anything. They do not even cook food for themselves. When hungry or thirsty, (maximum once in a day), they set out to accept ahara. They do not ask for it and accept where it is offered. Tīrthankara Rishabhadeva went to people to accept food. However, the people of that time did not know anything about the lives and disciplines of monks, as he was the first monk of Avsarpinī. The people of Ayodhya offered him gold, jewellery, gemstones, elephants, horses, expensive garments and even their daughters to honour their beloved king. But Rishabhadeva was not in search of these things. He sought only a morsel of food, but nobody offered it to him. Nobody understood that their king was looking for food to ensure that the monks who would come after him get food and water in the purest form needed to lead an ascetic life. As there was no choice, he had to fast for one year until King Shreyansa understood his need due to his “purva-bhava-smarana” (previous life). Shreyansa Kumar offered him sugarcane juice and thus Rishabhadeva ended his fast. This was on the day of Akshaya Tritiya. Hence, sugarcane juice is considered by Jains to be one of the best offerings. On this day, Jains observe a fast to commemorate their first Tirthankara Rishabhadeva and end their fast with sugarcane juice. In Hastinapur, there is a fair held on Akshaya Tritiya. Jains arrive from all over India in large numbers to end their fasts. The ritual ending of a fast by Jains is called parana (पारणा). Being Yugadi Tithi, it is most beneficial for performing meritorious (Punya Karma) deeds such as recitations (Japa), penance (Tapa), donations (Dana) ritual bathing (Snaana), sacrifices (Havan), burnt oblations to fire (Hooma). But initiation / conducting of activities like wearing sacred thread (Upnayana), ending of fast, house construction and entering thereof, traveling and plantation is prohibited in certain communities, while most look forward to start/restart relationships, purchases and commitments on this auspicious day. To some, it is beneficial for spiritual and not worldly activities. Worldly activities can be initiated during currency of this Tithi, however, aspirants must ensure that duration is not sullied by concurrence of malefic times observed according to the Hindu electional principles, and the moments are favourable to the doer by transits of the planets and the like. Aspirants are cautioned against using this Tithi blindly for initiating and conducting all types of life activities. Auspiciousness of the Tithis for specific activity depends upon simultaneous presence of Panchangam Shuddhi, Muhurt Yogas and host of other elements of Hindu electional astrology. Starting a new activity or buying valuables on Akshaya Tritiya is considered to bring luck and success. The religious merit that is acquired by giving gifts on this day is considered inexhaustible. Many buy new gold jewelry on Akshaya Tritiya. Most jewelry stores stock in new models for this occasion with “Lakshmi-inscribed” gold coins, diamond jewelry and golden dollars with the pictures of many gods and goddesses. There are vigorous campaign conducted by banks, jewelry shops and financial institutions, thus Akshay Tritiya has gained prominence. Although modern retailers are exploiting the materialistic urge in people, there is today a very high awareness regarding Akshaya Tritiya or Akha Teej. Candana yatra starts on this day, which is celebrated as well as the day on which treta yuga began. Barley, one of the main ingredients for homa, which is the yuga dharma of Treta Yuga, was also created on this day. 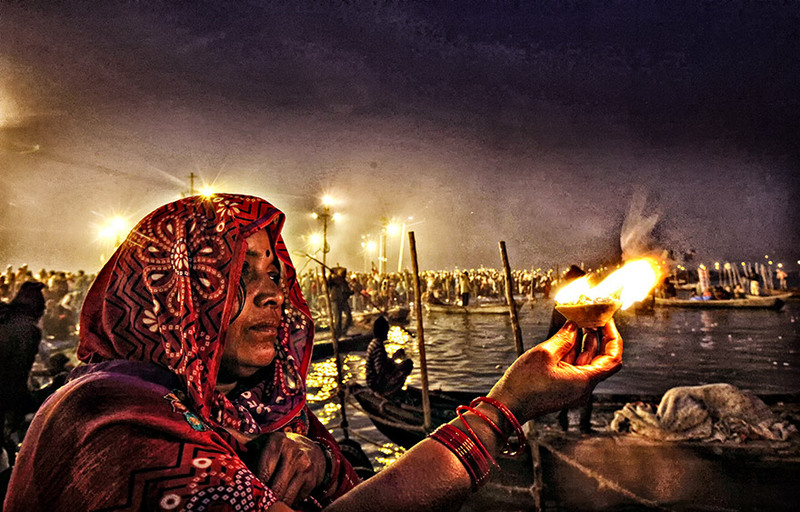 Ganga devi also descended to earth on this day. Many common people have special puja on this day. One should bathe in a sacred river, give charity, perform japa and offer barley in a sacred fire, and offer barley preparations to the deity. Akshaya Tritiya day is the very auspicious day – there’s no inauspiciousness to be found today so even checking muhurthas is considered unnecessary, so auspicious it is. Whatever one does for devotees, and for Krsna that person will get more benefit and it is eternal benefit and never lost. He said one story of a brahmana: there was a brahmana who had a very good wife and was poor. Whatever little money he got would get spent somehow. Also he did not have children. So under the strong request of his wife he went to Vasishta muni to know the reason for his suffering. Vasishta muni told him that in his previous life he was very rich and also had many children. But he was very stingy, he was not even spending for his own children. This is the reason for his being poor, also without children. Then that brahmana asked Vasishta muni why he got a good wife. So that Muni replied that somehow with some reason, he observed that the vrata of Vaishaka month for the last 5 days. So he got a good wife and also the brahmana birth. Then the muni advised him to follow at least the last 7 days left of Vaishaka month, with devotion to Lord Krsna. Since that brahmana observed the vrata of Vaishaka month for that at least the left out 7 days, he got sons, he became rich, ultimately he got Love of Godhead and went back to the spiritual world! It is important to hear such a story/pastimes as this so that at least by hearing this, we engage ourselves in the service of Guru, the Vaishnavas and Krsna. Thus becoming inspired to always render service the devotee is always the beneficiary of such interaction with the Vaishnavas, one’s Guru and Lord Sri Krishna. Akshaya tritiiyaa: (from the Calendar of the Madhwa Vaishnavas) The third day in the bright fortnight of vaishaakha is the day of the incarnation of Lord Vishnu as Parashurama. The icon is decorated with an axe, to depict Him in a heroic pose. This coincides with the anniversary of passing of Sri Vijayadhvaja Tiirtha, the sixth piithaadhipati in the lineage of Sri Pejawar Mutt. He is famous for his commentary upon the Srimad Bhaagavata epic. He lived in the 15th century and his vrindavana (samadhi) is in Kanva Tiirtha. There is also a pipal tree by the side of the vrindavana under which he is believed to have written his commentary. On the Pandavas return to Hastinapur they resided in the palace created for them by the demon Maya Danava. Mayasura built this palace out of gratitude to Krsna for saving him in the forest fire in the Khandava Forest where he was hiding when Agni devoured it. He also presented Bhima with a magnificent fighting club. After the Rajasurya sacrifice was performed, Duryodhana, being always envious of the Pandavas, came to the mansion created by Maya Danava’s illusions. Bewildered by illusions of many kinds, Duryodhana mistook the solid floor for water and lifted the end of his garment to walk forward on what he thought was shallow water but it was solid floor, and after a few more steps he fell into waist deep water mistaking it for a solid floor. Proud Duryodhana, who was wearing his crown and a costly necklace was very angry, but when he fell into the water everyone laughed, especially Draupadi and Bhima. Yudhisthira tried to check the laughing of all the women in the palace, by raising his hand and his glances. Lord Krsna however, encouraged it by the suggestive gestures of His eyebrows. Humiliated and swearing revenge, Duryodhana turned his face downwards and went back to Hastinapura. The Kurus then made a conspiracy to trick Yudhisthira into a gambling match by which the Kauravas (Kurus) could cheat the Pandavas out of everything with the dice made from Sakuni’s bones. During the match Yudhisthira lost his kingdom, wealth, jewelry, clothing and finally even gambled and lost his wife. When Dussasana went to fetch the chaste Draupadi, she said she couldn’t come to the assembly as she was undergoing her monthly period, and was only dressed in one piece of cloth (a simple ‘sari’). Draupadi had a beautiful bunch of hair which was sanctified at the ceremonial Rajasurya Yajna, but Dussasana defiled that sacred lady and grabbed her by her hair just to insult her. When he started to pull off her sari just to make her naked, Draupadi, realizing that she had no hope of help from her husbands as they too had been lost, by Yudhisthira being tricked into upholding mundane moralistic codes and now had no free will to act (though Bhima was transcendentally situated from such sentimental codes his brothers tried to make him restrained to follow Yudhisthira’s mood and etiquette). Draupadi then cent per cent, completely surrendered to Krsna, and to the amazement of the assembly, as much ‘sari’ as Dussasana took from her body, as much again replaced it. Lord Krsna, though protecting his surrendered devotee, decided that for their sinful behaviour the Kurus would be inevitably killed at the Battle of Kuruksetra and all of their wives would too loosen their hair in public, but this time as widows. When the Pandavas were exiled to the forest for twelve years after a second gambling match, the Kurus made a clause, that after the completion of twelve years the Pandavas had then to spend one year incognito, thus making thirteen years all told. If, during the final year the Pandavas’s whereabouts were discovered, they again had to spend another twelve years in the forest. Because the Pandavas were concerned how to feed the ‘brahmanas’ who accompanied them to the forest, Srimati Draupadi Devi was given a pot by the sun god called by Aksayapatra. This pot would never be empty until Draupadi had taken her meal and turned the pot upside down. Then it would produce no more for that day. Once Draupadi had finished cooking and had just taken her meal when the Muni Durvasas arrived with many of his disciples. The angry sage Durvasas and his disciples had secretly been asked to go there by the Kauravas who knew that by this time Draupadi would have taken her meal, and if she was unable to offer them anything to eat, she would incur the wrath of Durvasa. Durvasas and his disciples went to the river to bathe and freshen up before taking their meal. Draupadi, full of anxiety, prayed to Lord Krsna to help her. Lord Sri Krsna then told Draupadi that if there was a morsel of food left He would be satisfied if that were offered by Draupadi, His pure devotee with love to Him. 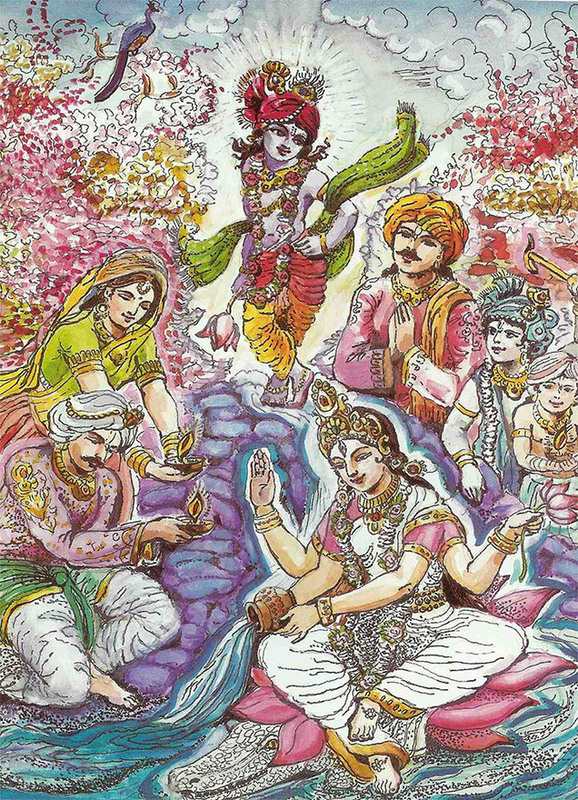 Seeing a fragment of spinach stuck to the side of the pot, Krsna asked for it, Draupadi offered it to Krsna, and simply by eating that morsel of foodstuffs, all of Durvasas’ men and Durvasa himself became completely full and satisfied, and out of embarrassment slipped away and didn’t come to demand a meal from Draupadi as the sinful Duryodhana had arranged for them to do. Candana yatra starts on the third lunar day of the waxing moon of Vaisakha month, May 12th, and continues for twenty days. Lord Jagannatha gave direct instructions to King Indradyumna to perform this festival at this time. Smearing the body of the Lord with ointments is an act of devotion, and the best of ointments is sandalwood paste. Since the month of Vaisakha is very hot in India, the cooling effect of the sandalwood is very pleasing to the Body of the Lord. Sandalwood paste is applied all over the body of Jagannatha leaving only his two eyes visible. The utsava murtis (functional Deities – Vijay utsav) are taken on procession and are placed in a boat in the temple pond. To commemorate this festival, Lord Caitanya also carried out water sports with his devotees. There are very useful information but few repeatitions which could have been avoided. NextIs Sri Lanka the Lanka of the Ramayana?